Walmart is having a large sale on select portable Apple gear just in time for the holidays, discounting iPhone 5 to $127 with a two year contract, and selling the iPad 3 for just $399. The Phone 4S is also available for $47 with a two year contract, but considering the large discount on the new iPhone 5, the 5 is clearly the better deal. Either iPhone can be purchased for any of the major networks in the USA, including AT&T, Verizon, and Sprint. Purchases must be made at Walmart retail stores. As noticed by MacRumors, Walmart made the announcement on their Facebook page, shown below, with a message stating “Nothing is merrier than iPhones on Rollback, just in time for the holidays.” It’s unclear how long the sale will go on for, but the wording suggests it will continue to be discounted through the holiday season. The iPhone 5 is the best iPhone ever, and the base 16GB model is what we have recommended to buy because it delivers the best bang for the buck. Discounted, this is even more true. Typically retailing at $199 with a contract, Walmart’s discount is the thus far the largest seen, and is now the cheapest place to get a brand new iPhone 5. Electronics retailer Radioshack is the next cheapest, offering the same device at $150 with a contract. The iPad 3 at $399 is also a great deal, coming a full $100 off the standard retail price. From Monday onward, Walmart will also offer a $30 iTunes Gift Card with the purchase of a new iPad, according to MacRumors. Update: Walmart PR contacted us to note the iPad on sale is the 3rd generation at $399, not the iPad 4 as originally stated. 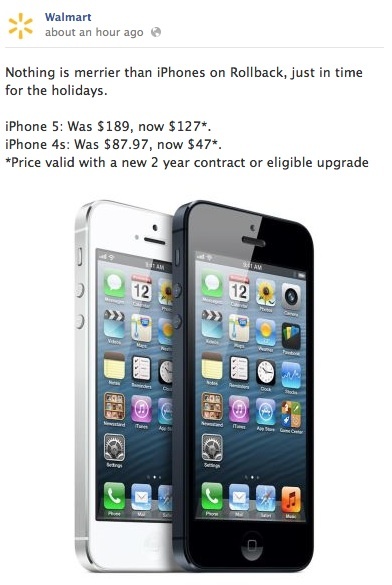 The iPhone 5 discount remains the same. Yeah, what lovely timing. I just upgraded my 4 to a 5 at the Apple store last week. I went to Apple and they said no we can’t match the pricing – you’ll have to return your phone and buy it at WalMart to get that price. So in effect I’d have to cancel my AT&T contract? Yeah, thanks Apple.